Light and agile, your MacBook Air has served you well. Its portability and functionality are the definition of what a convenient laptop is, but you’re now ready to upgrade or move on. With various sites and selling options online, it’s easy to get lost in what should be a secure and simple process for selling your old tech. Well, look no further. You’ve come to the perfect place to sell your used MacBook Air. WHY SHOULD I SELL MY MACBOOK AIR TO GAZELLE? It’s easy, really. We not only provide you a fair offer for your preloved device, we also deliver on our promise of a secure, simple and safe selling process. Selling your MacBook Air to Gazelle means that you’re in the hands of a trusted buyer, with guidance every step of the way. It’s a chance at second life for your device, peace of mind for you and more money put back into your wallet. I’M READY TO TRADE IN! Creating an estimate of your used MacBook Air or other devices only takes a few moments online. You’ll answer a few questions regarding the condition of your gadget, and we make you an offer instantly. You have 30 days from this point to send us your MacBook Air, and we pay for shipping by sending you a box. If you have your own box, no problem. You can also print out a prepaid shipping label from the offer page. It’s important to note that if you don’t send us your device within the 30-day window, you will have to recreate an offer online. After it arrives at our facilities, our Gazelle inspectors give your MacBook Air a quick check-up to ensure the estimate we gave you matches the condition of the laptop. If we must give a new estimate on the device, we’ll contact you via email and you’ll have the option to decline the trade in and have the laptop sent back to you, no-strings attached. If you accept the offer, we send you payment within 10 business days. And just like that, your used MacBook has a new home while you enjoy more funds! So, what are you waiting for? 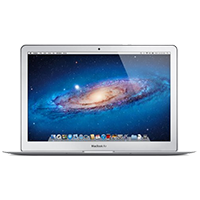 Create an offer and get started on trading in your used MacBook Air today.